With two last names it doesn't matter how many times I put myself on the no-junk-mail list. Thopse credit card people are sneaky and always around the holidays I end up with 2 credit card offers a day. I came up with a cool idea to recycle those rely envelopes. 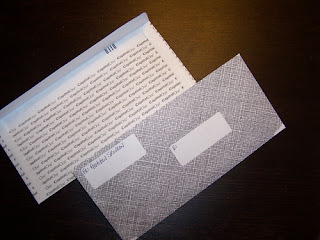 On the back of the reply envelope slowly separate the flaps from the back of the envelope. Then turn the entire envelope inside out and tape the flaps to the back of the envelope. 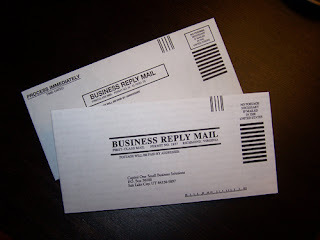 If the envelope has a print on it, like mine, you can use labels to handwrite the To and From adresses or simply print the address from your computer on labels and secure. I will have to try that myself. I get about 2 or 3 credit card applications a day, way too much. What is the site for no junk mail? I didn't realize they had such a thing. I use the envelopes to store coupons. I have one envelope for each major section of the grocery store (produce/deli, condiments, entree, cereals/breakfast, and so forth). I also have one envelope for household products and one for beauty products, and one for other coupons (such as Michael's, A.C. Moore). 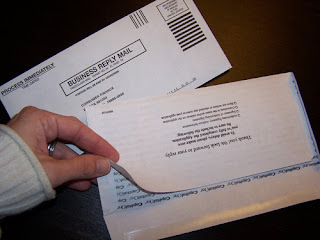 The envelopes wear out after a while, so I recycle them and use fresh junk mail envelopes. They're also good for using when keeping score in pinochle, Scrabble, or Boggle, or for when making a shopping list--I move the coupons I want to use into the envelope with the list.